2006-05-24. New. Ships with Tracking Number! INTERNATIONAL WORLDWIDE Shipping available. Buy with confidence, excellent customer service! 2006-05-24. Good. Ships with Tracking Number! INTERNATIONAL WORLDWIDE Shipping available. May not contain Access Codes or Supplements. May be ex-library. Shipping & Handling by region. Buy with confidence, excellent customer service! Da Capo Press. PAPERBACK. 1560258586 New Condition. . New. Da Capo Press. PAPERBACK. 1560258586 Like New Condition. . Fine. Da Capo Press, 2006-05-24. Paperback. Used:Good. Da Capo Press, 2006-05-24. Paperback. Good. Da Capo Press. As New. 2006. First Edition; First Printing. Trade PB. 9781560258582 . NO defects. No notes, names or ANY markings. ; 195 pages . Thunder's Mouth Press. Used - Acceptable. Ships from Reno, NV. Former Library book. Shows definite wear, and perhaps considerable marking on inside. 100% Money Back Guarantee. Shipped to over one million happy customers. Your purchase benefits world literacy! Thunder's Mouth Press. Used - Very Good. Ships from Reno, NV. Former Library book. Great condition for a used book! Minimal wear. 100% Money Back Guarantee. Shipped to over one million happy customers. Your purchase benefits world literacy! Thunder's Mouth Press. Used - Acceptable. Former Library book. Shows definite wear, and perhaps considerable marking on inside. Thunder's Mouth Press. Used - Good. Former Library book. Shows some signs of wear, and may have some markings on the inside. Da Capo Press. Used - Acceptable. Acceptable condition. Da Capo Press, Incorporated, 2006. Paperback. Very Good. Disclaimer:A copy that has been read, but remains in excellent condition. Pages are intact and are not marred by notes or highlighting, but may contain a neat previous owner name. The spine remains undamaged. Da Capo Press. PAPERBACK. 1560258586 Has some shelf wear, highlighting, underlining and/or writing. Great used condition. A portion of your purchase of this book will be donated to non-profit organizations. Over 1,000,000 satisfied customers since 1997! We ship daily M-F. Choose expedited shipping (if available) for much faster delivery. Delivery confirmation on all US orders. . Very Good. 2006-05-24. 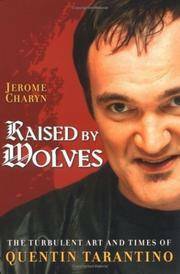 Raised by Wolves: The Turbulent Art & Times of Quentin Tarantino. Thunder's Mouth. New. Fine. Paperback. 2006. Originally published at $14.95. Thunder's Mouth. Used - Like New. Fine. Paperback. 2006. Originally published at $14.95.